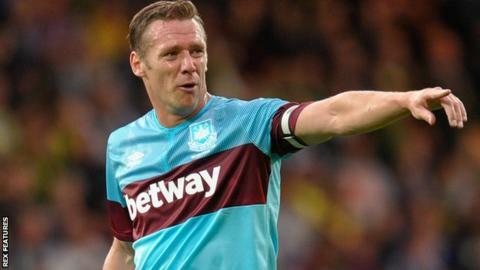 League Two side Leyton Orient have appointed former West Ham midfielder Kevin Nolan as player-manager. The 33-year-old, who left the Hammers in August, has agreed a two-and-a-half-year contract at the Matchroom Stadium. Orient have been without a boss since head coach Ian Hendon was dismissed on Monday following a run of four wins in 21 league games. "Kevin brings with him invaluable expertise and know how," said a statement on the Orient website. Nolan, who began his career at Bolton and also had a spell at Newcastle, becomes the youngest manager in the Football League, ahead of Wigan's Gary Caldwell. The uncapped Englishman has scored 99 goals in 522 league appearances since making his professional debut in March 2000. "Kevin's hunger, desire and passion to succeed at Leyton Orient, coupled with his experience, were key in the decision process," added the club statement. "The club believe they have the man to take Leyton Orient forward and improve the club's position." Orient were relegated from League One last season and started the new campaign well under Hendon, who took charge after they suffered the drop in May. They were top of the table after winning their first five games of the season but have since slipped to 11th, three points off the play-off places, leading to O's president Francesco Becchetti to dismiss Hendon. Nolan, who spent over two months training with the O's at the end of last year after leaving the Boleyn Ground, will lead the east London club for the first time against Wycombe Wanderers on Saturday. He becomes the sixth different man to take charge of Orient since Becchetti took over the club in the summer of 2014. Meanwhile, Queens Park Rangers defender Cole Kpekawa has extended his loan deal with the O's until 1 March. The 19-year-old has made nine appearances since moving across London in November.